Picture this: You’ve just closed a great deal that took weeks, maybe months, of hard work. But once the dust has settled and the final project numbers have come in, you see that the job margin has shrunk dramatically. Why does this happen? The lack of a robust, customized statement of work with a detailed scope of what you’re providing to the customer may be the culprit. Less than 50% of technology resellers provide customers a statement of work (SOW). And for those that do, the SOWs often only list generic services and legal terms. 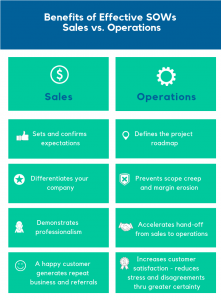 If you really want to set yourself apart from the competition and maintain healthy project margins, shut down scope creep in its tracks with a well thought-out, customized statement of work. Many people think that because the SOW describes the implementation details – what happens after the sale is complete – they can complete this document later in the sales process, or perhaps after the deal is sold. This is a crucial mistake, and an expensive one. The details of a SOW begin with the first questions asked during the discovery process. Pre-sales mistakes lead to post-sales pain. If you are experiencing shrinking project margins, numerous change orders, or customers complaining about “nickel and diming” them, the fault may reside in an insufficient discovery process. A good discovery process identifies customer needs and issues along with requirements and constraints. It becomes the catalyst to designing the proper solution, accurately calculating implementation labor, and confirming and communicating expectations. You’re already doing discovery … but are you taking a long-term view toward the end game? Are you only scratching the surface and merely learning your customer’s wants, or are you digging deeper to uncover what they actually NEED and planning ahead for what that entails? Are you ASSESSING or are you GUESSING? Gone are the days of selling “boxes” and “speeds and feeds”. We live in an age of applications, which require a greater understanding of customer needs, specifics of the proposed software, and how the application will be configured. In the world of selling complex, custom-fit applications, the SOW is becoming even more important to closing the sale. Without a thoroughly defined scope of work, the customer can only assume what you’ll be providing, leading to misunderstandings that can end up being very costly to the solution provider. If expectations are not set properly, your implementation team may believe they are delivering only one or two software features, while the customer may think they are getting “everything”. A customized statement of work identifies both what IS included and what IS NOT included in the sold solution. In addition, the SOW details who is responsible for what. For example, the customer will know he’s responsible for having a properly configured network in place prior to your laying a communication solution on top of it. What’s the best way to safeguard that your discovery process will drive a solid statement of work? By automating it. With the right tools – like CorsPro’s SalesDoc Architect – you can program questions, rules and workflows to ensure that all scope of work questions and issues are addressed in advance. The answers to the pre-programmed discovery questions become the basis of the scope of the project. It then defines the solution to be provided, and is communicated in the proposal and statement of work you deliver to your customer. Furthermore, when using an automated process, answers to discovery questions can drive configuration logic that auto-calculates labor hours. 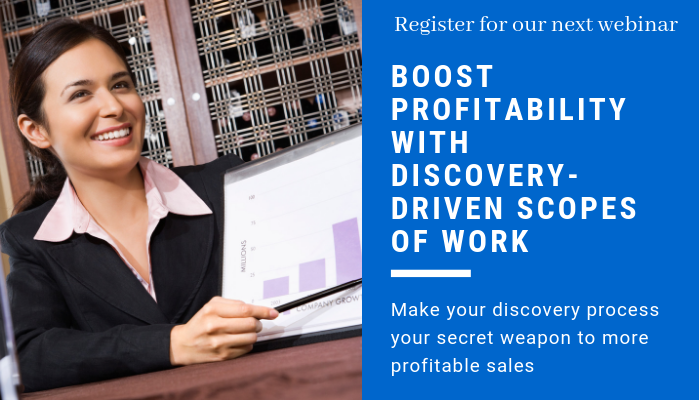 Answers to discovery questions not only build your proposal but also your scope of work. Using the example of a communication solution, discovery answers automatically build the type of communication solution required, including number of users, required labor AND equipment and licenses. Your statement of work should reflect this information, therefore providing an accurate project scope. Using a familiar Excel interface, SalesDoc Architect uses its discovery module to step you through the information that needs to be gathered from the customer. Next, the collected data is automatically fed into calculations that auto-configure products, services and labor, and then into the content of the documents you generate from SalesDoc Architect. For example, let’s assume that during the discovery phase you find out that the customer is going to handle their own data network for the implementation, meaning you don’t need to add any additional data networking labor to the labor total. By selecting “Customer” as the answer to the “Who will manage the network?” question, SalesDoc Architect automatically includes SOW language stating that the network is the customer’s responsibility. Asking the right questions up front positively impacts the sale and implementation of your solutions. Don’t short-change the discovery process. This crucial first step can – and should – drive the immediate next steps and final steps, ideally with all-at-once automation, and feed directly into your proposal and statement of work. The discovery process lays the foundation for a long-term customer relationship, showcases your expertise, and protects both you and your customer from costly misunderstandings and delayed implementations.